The last time Bellamy and Jasper were out in the forest together was back in the sixth episode of season one. Bellamy was somewhat forced along to go with Jasper this time, and it was for safety protocol. During this crazy, and inquisitive trek, Jasper tells Bellamy that you can’t erase your mistakes, no matter what you do. He does carry a valid point, yet you can try to better yourself and learn from your mistakes. Jasper is living it up this season, but I am also afraid for him. Later on, Bellamy decides to let loose at the Arkadia party with Jasper, a move I am not fond of. But, that is just me, guys. 4. Indra? A Sharp Shot? For a culture strongly against firearms, and using weaponry of their own realms, it was a little surprising to see a a royal clan member use a gun. I remember when Indra refused to use them in season three., but now she shoots like a professional. Now, I don’t like guns, but it was surreal to see this. Indra done it simply because Azgeda and Trikru are enemies, despit the Skaikru shifty alliance with Azgeda. I think that the shooting should not have happened as this will provoke new tensions. In addition, I think that both clans will fight even harder to guarantee a spot in the bunker. Talk about humanity and not wanting to overstep boundaries. Abby had every good reason to wreck the radiation chamber. It was a symbol of pure love and protection for her daughter, Clarke, and also to stop sacrificing innocent lives. It was a powerful moment, and a rough side of the doctor that we rarely see. Yet, this affirmatively proves that Abby will do anything for Clarke. But now with the chamber gone, Jaha’s commitment to finding the second bunker is more crucial then ever. Leave it to Jaha to not give up. He had found a solution to bring the ARK down in season one, found the “City of Light” in season two (Not the best), and now, he has found the second bunker that could possibly save lots of people. With what happened last season though, will people listen to him? It will be hard, no doubt, but if folks want to survive the death wave, they better take the advice. My question is is how everyone will adjust to living in such a cramped space. I guess we will see how that pans out. And, the ending looked like something from Indiana Jones. Pretty cool. I just hope that we get more Jaha and Kane, because those two are awesome together. Emori was next in line to be tested on, and it was a huge risk as she could die. Abby did not have the heart to inject the Nightblood bone marrow, so Clarke decided to do it. Well, she thought she could. It turns out that she didn’t have the heart either, so what does she do? She injects the Nightblood into her own arm. Everyone is in a wave of shock, but it is understandable. A few hours later, Clarke is ready to go into the chamber. 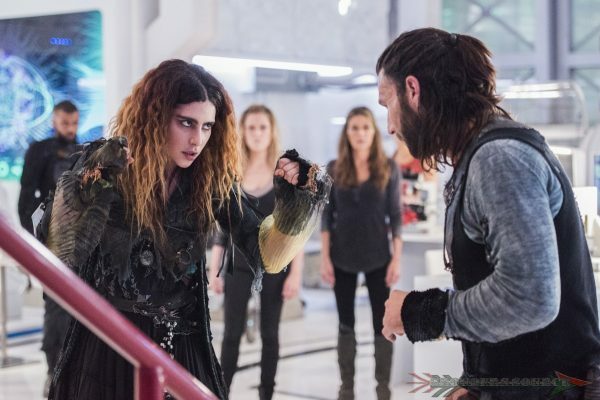 However, Abby is very staunchly against it, knowing that Clarke will die if she goes into it. That is when we witness Abby destroying the chamber. With Clarke now being a Nightblood, will she become the future commander, or will she have serious side effects like last time? Ooh, one possibility has lots of bloom, while the latter I fear. Each one of these moments has a connection to the prior seasons. That is always interesting as it refreshes our minds and what has lead up to the current. That concludes this round of The Top Five OMGs. The 100 will return April 26th with the episode, DNR.